PureCloud was designed to simplify the way you manage customer relationships. It’s powerfully simple, fast and intuitive. But you don’t have to take our word for it. 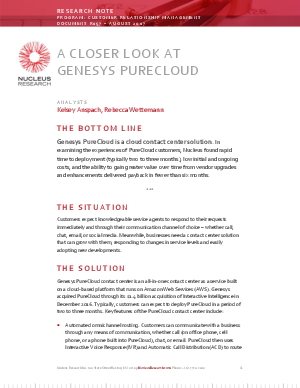 Get a better look at the benefits and tools of Genesys PureCloud in a new report by Nucleus Research. For their study, Nucleus examined past and current customer experiences, breadth of functionality and results of use. PureCloud tools like automated omnichannel routing, social channel management, outbound dialing, integration with other software and analytics and reporting. Benefits of the platform such as lower costs, increased flexibility, improved time to value, and better workforce optimization. Current customer success stories and the future of PureCloud.